Another housing develop under construction. Is this call progress? Is this destruction of open space or just better utilization of land? Either case can be argued until your blue in the face. The fact remains a new large-scale development has just popped up near our beloved Lynn Woods. Similar to the Bow Ridge development occurring in 2003, this Lynnfield property will provide housing for a number of occupants and bring it's share of problems for us to ha ndle. We heard about the City of Lynnfield trying to develop a section of property land-locked by Lynn Woods under a proposed Land Swap Agreement with the City of Lynn back in 2005. You can read about this proposed Land Swap by clicking this link. That proposal was denied by the City of Lynn flushing the request down the toilet. 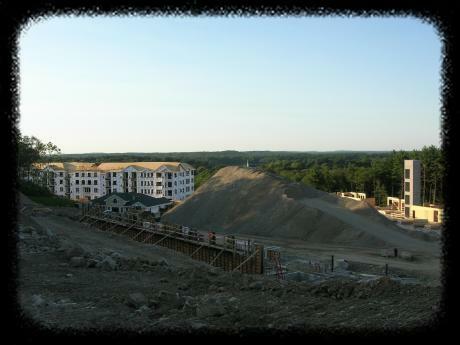 We all believed this would be the last push by Lynnfield to develop land that threatened the trails of Lynn Woods. 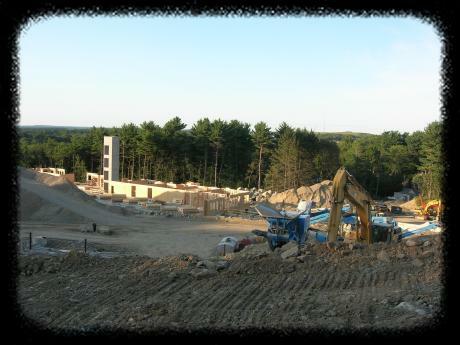 Six months ago we got a whiff regarding a new development breaking ground near Lynn Woods. We were worried this development was occurring on the proposed land swap property, but after calling the City of Lynn we were assured it was not. We then called over to the City of Lynnfield building department and were told a development would be constructed on property adjacent to Route 1 North. Not much information on exactly where it was, but at least it is not in the middle of Lynn Woods. Three months ago, trees were cleared and boulders were blasted to make way for a new residential development in a location known as Lynnfield Commons. Again, this is not the same property that was under discussion during the proposed land swap, but it is close enough to the Skulls Trail to get a birds eye view of what soon will be more traffic and problems we will need to deal with. We did a little research and turned up some information regarding the new development behind the Mercedes Benz dealership on Route 1 North in Lynnfield. Apparently this site will be home to a mix of 200 apartment/condominium units spread across three large buildings. Legal petition to develop this 13.6-acre site started back in 2005 and was heavily apposed by Lynnfield Town Selectmen. However, due to Massachusetts Legislation M.G.L Chapter 40B, the development received approval to begin construction in 2008. Occupation of these apartments is slated to begin in late 2008, early 2009. This is a point of opinion and assumption on Dieselbikes part, but we find funny the Lynnfield Selectmen were apposed to this development location since the town approved to put a similar development on the property site proposed in the Land Swap deal. What does this mean to us mountain bikers? Hopefully nothing! There is a 2-acre (average) buffer between the official boundary of Lynn Woods and this development, but many of the trails near the old Lynnfield playground that are not officially in Lynn Woods run parallel to this property. We can only hope this will not be the beginning of problems for our beloved trails. On a more positive note, the construction will not expand any further beyond the current area markers. 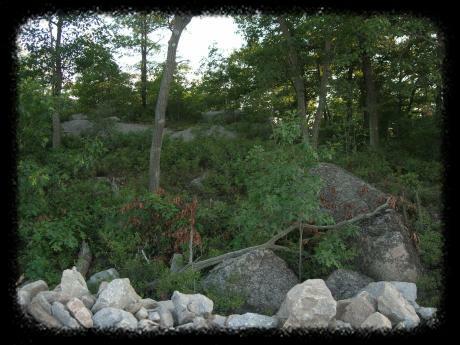 This 13.6 acre parcel has currently land locked a few plots near the old quarry. The majority of remaining land behind this development spanning towards the power line is protected under Massachusetts Conversation Restrictions, so there may not be any more development for at least 20 year. All we can do as a riding community is step up our rider ship in this area to show recreational presents. This will at least help keep our trails in good condition and keep out possible riffraff. We have provided some additional web links below related to this property for your reading pleasure.